"For over 35 years the Humphrey family has entertained visitors from around the world at the Bar J Ranch. Founded by Babe Humphrey in 1977, the Bar J Ranch and Bar J Wranglers provide a western experience that the whole family will enjoy. Babe taught his sons, Scott and Bryan, the importance of family values & western hospitality for which the Bar J has become renowned. By providing an authentic, western, family experience at an extraordinary value, Scott and Bryan ensure that their family tradition is honored and preserved. Performing nightly at the Bar J Chuckwagon during the summer season, the world-renowned Bar J Wranglers celebrate the traditional music of the old west with the unique blend of musical talent and comedy which Babe established. From old classics to boot-stompin', original melodies, these hard-working cowboys will put a smile on every face. When the snow drifts into Jackson Hole, the Wranglers are on the go bringing the Old West coast-to-coast for community events, concerts and more. Western hospitality is a way of life with the Thomas family. This heritage dates back to 1854 when "Uncle Nick" Wilson, as a boy of 12, passed through Jackson Hole with the Shoshone Indians. Nick in later years rode for the Pony Express and drove the Overland Stage. 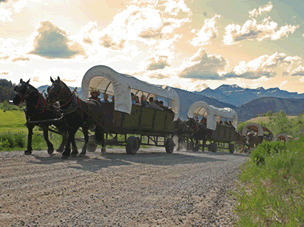 Uncle Nick drove the first covered wagons over Teton Pass into Jackson Wyoming. The little town of Wilson, Wyoming at the foot of Teton Pass still bears his name today. Experience a never to be forgotten western adventure. Step back in time as you climb aboard our covered wagons and ride to our outdoor dining room on the bank of a clear mountain stream in beautiful Cache Creek Canyon. Top off your evening whooping it up with the Bar-T-Five singing Cowboys, Indians, and Mountain Man. For dinner, eat your fill of mouth-watering roast beef, scrumptious barbecued chicken, corn on the cob, Dutch oven baked beans, fresh green salad, rolls, coffee, lemonade, and brownies. Parking is convenient and spacious.